We're proud to introduce our most technologically advanced streaming analytics appliance yet: The ExtraHop Rose Gold Edition. The Rose Gold Edition is enhanced in every way. We listened to feedback from IT Ops teams, database administrators, CIOs, sysadmins, and everyone else that makes the ExtraHop community so rich and vibrant, and we took all their feedback into account to create the most advanced stream analytics platform ever. The precision alloy of copper and gold on the faceplate enhances the speed and accuracy of our real-time stream analytics. The rose gold in the solid state drive enhances storage capacity and read-write speeds, so you never have to wait for your wire data insights again. 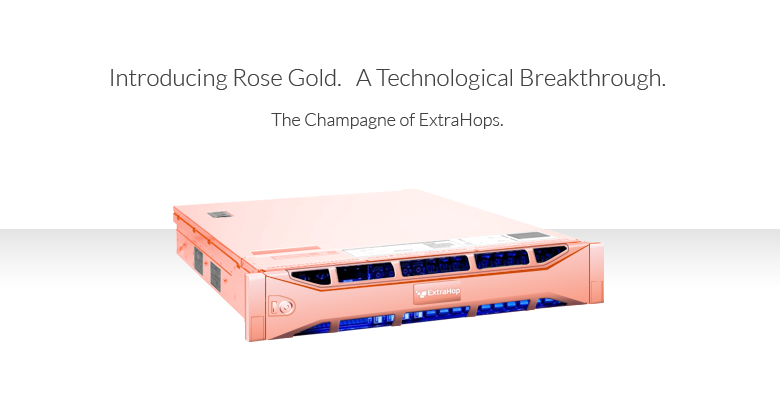 The ExtraHop Rose Gold Edition is more than a network appliance. It is a vision. It represents a dreamscape of an IT Ops future where MTTI is zero, network latency is a thing of the past, and the War Room is a gilded celebration room where wheezing racks of shelfware have been replaced with ever flowing fountains of sparkling wine. The vision of a golden, 1U appliance, analyzing data in real-time, and capturing its value inherent, is something we all believe in. But at ExtraHop, our vision is even rosier. Looking at your data through the ExtraHop Rose Gold Edition shows an IT landscape where you're in control, you've got the power, you're in charge. The ExtraHop Rose Gold Edition makes you look good.